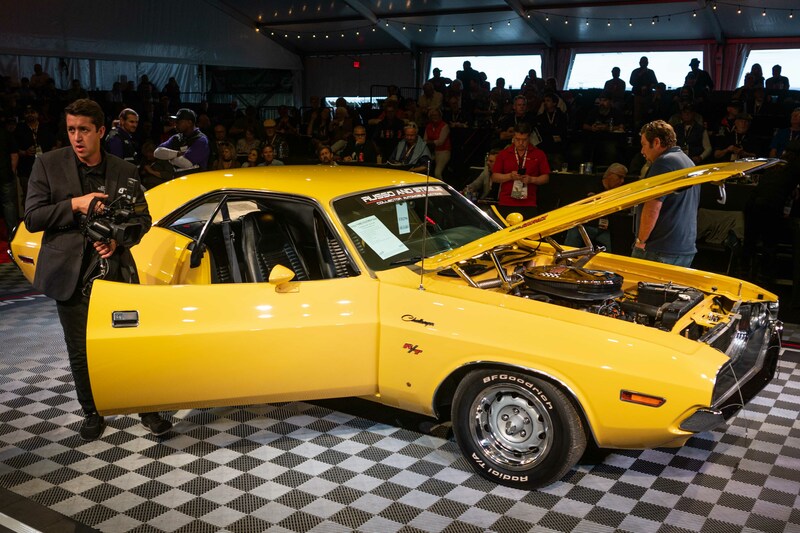 A rain-soaked field will be home to the Russo and Steele auction for the next four days, during which more than 500 cars will roll across the block. The bidding at Salt River Fields at Talking Stick opens Thursday with a 1994 Club Car DS golf cart and concludes Sunday afternoon when a 1969 Chevrolet Corvette will be the last car across the block. 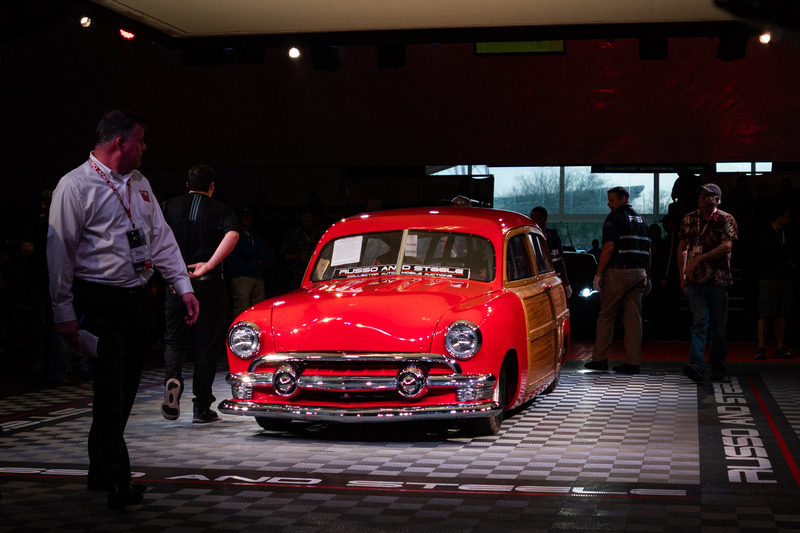 An impressive array of cars filled three tents during an auction preview day Wednesday. 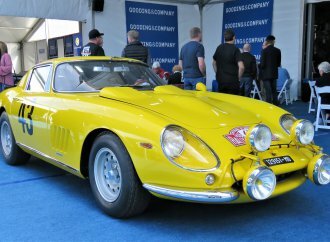 Prospective bidders and car lovers alike strolled the damp grounds (Scottsdale was hit by a decent rain storm the day prior) and wandered among some great examples of American muscle and imported classics. 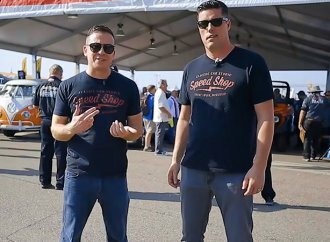 Russo and Steele will offer a 1964 Cheetah SPCON Race Car raced by Jerry Grant at Daytona, a special-ordered 2017 Ferrari F12 TdF coupe, an award-winning 1969 American Motors Scrambler vintage drag car, and even a pre-production prototype 1970 Chevrolet Chevelle SS396 coupe. Russo and Steele’s auction will kicks off at 12:30 p.m. Thursday. If you want more information about it (including how to bid online), check out the auction website. Modified Power Wagons have been all the rage for a while now, but I’ve seen very few — actually, any — converted with a custom-made camper in the bed made from solid oak, complete with engraving and brass hardware. The camper has a sleeper and kitchenette, a sound system and interior lights. There is cedar-lined storage under the bed, which will not only keep your clothes out of the way, but make them smell magnificently woodsy. The copper camper roof nicely complements the burgundy paint with white pinstriping. 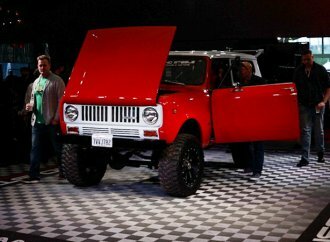 As one spectator put it, “This is just cuter than [expletive].” Powering the, well, Power Wagon is a Chevy small block. The camper is equipped with four-wheel drive, a jack, shovel, pick axe, air compressor and propane and water tanks, which is basically saying its ready to go on some great road trips. Jaguars are mainstays in the imported classic conversation, and for good reason. 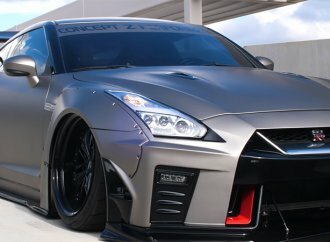 They offer some incredible curves, in addition to a great driving experience. 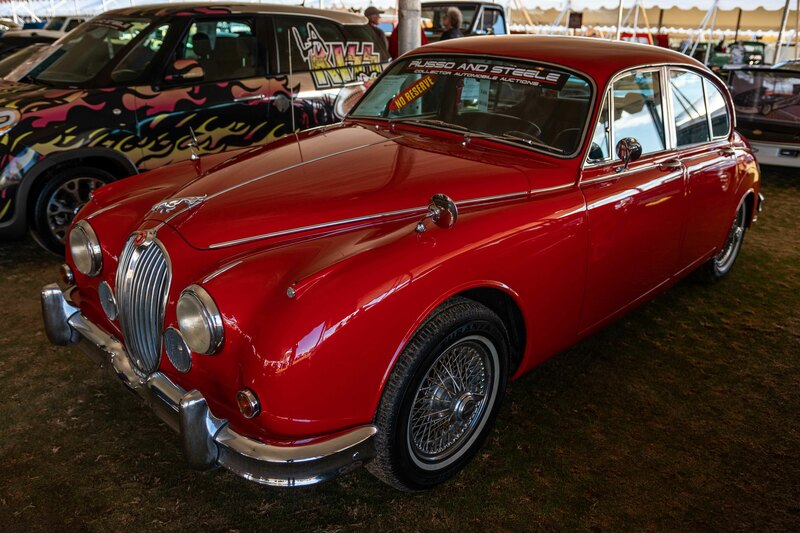 This ’67 coupe — which the listing calls a “rust-free, Palm Springs, California vehicle” — was the final year of Jaguar’s old-school look before it transitioned to the sleeker E-type look in 1968. The 340 has a two-stage paint job, which shined brilliantly, even in the shade. The interior, complete with its Nardi wood-trimmed steering wheel, has been restored. The chrome and stainless trim is original to the car. It has a 3.8-liter General Motors engine under the hood. Some modifications that allow it to perform better in the desert and heat were made, though the listing did not mention specifics. Even better? 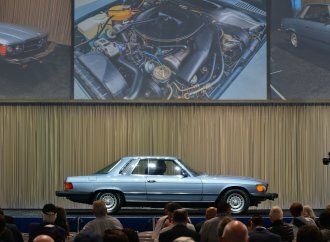 The coupe is being offered with no reserve, meaning there is no minimum price that must be met before the car can be sold. This wagon had one of the prettiest color combinations at the auction. 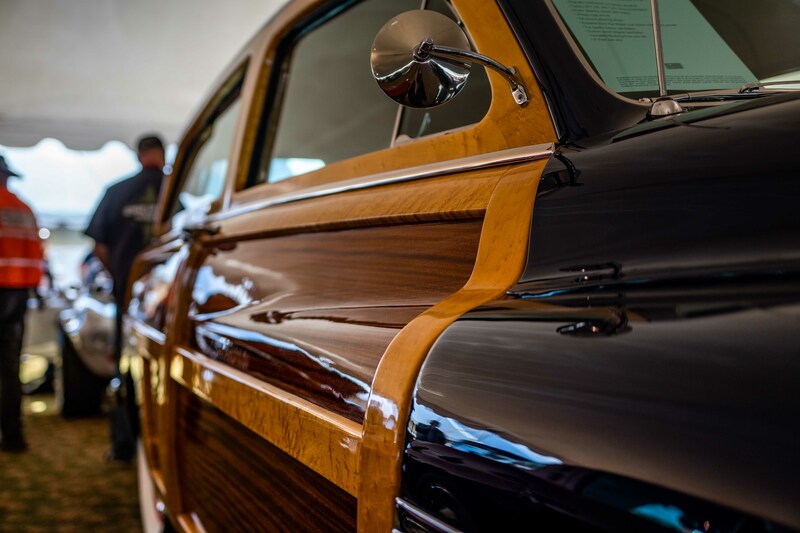 The dark blue paint and big white wall tires really helped the gorgeous Bird’s Eye Maple wood paneling pop.The wood tailgate was custom-fabricated.Originally refurbished for the owner’s daughter, the American classic still has its factory LS-1 V8 350cid turbo engine with an automatic transmission. Power steering, power disc brakes, a complete Ford Mustang front end clip and 9-inch Ford rear end were added later. To say Volkswagen Beetles are a common sight at collector car auctions would be a drastic understatement, as would calling this specific Beetle “nice.” The ’54 coupe has been completely restored to concours condition. It is still painted the original Stratos Silver with a Dove Gray interior. The metal, pan and glass are also original. Even the semaphore turn signals still work. The 1192cc engine is capable of a whopping 36 horsepower. It is mated with a 4-speed manual transmission. It will be sold with several documents, including the car’s birth certificate, and also comes with a wood dipstick for the gas tank. 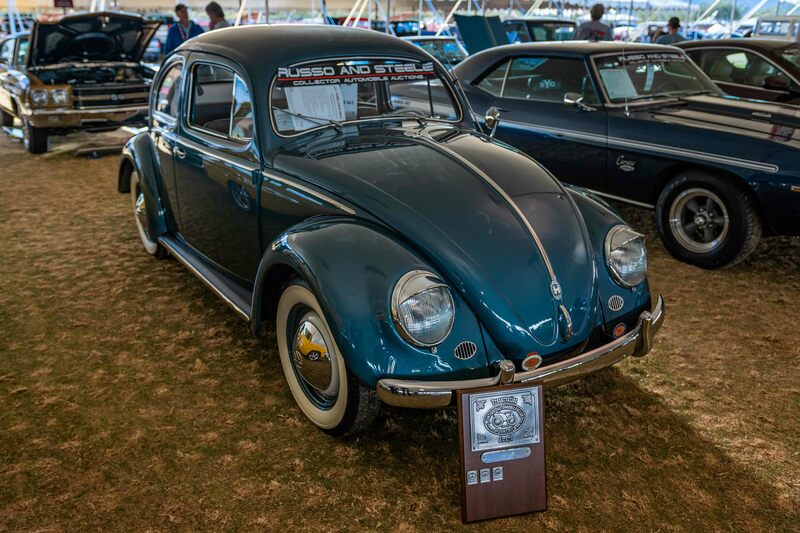 The Beetle took the top prize at the AACA Grand Nationals three yeas ago. Antique cars are cool –- plain and simple. But a vintage vehicle registered as one of just eight is cool beyond belief. 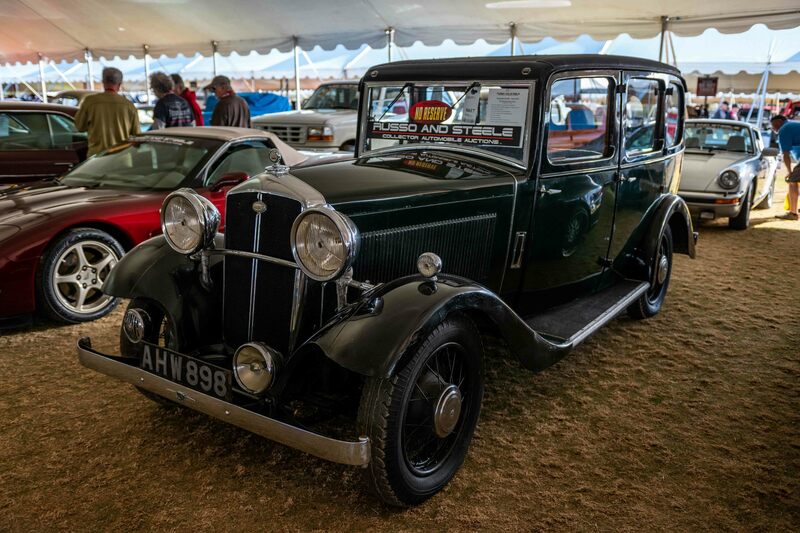 Such is the case with this Wolseley Sixteen Salon, which was brought to the United States from England in the late 1940s.The 6-cylinder engine “runs and drives well,” according to the listing, and the car has an auto clutch and auto start. All of the interior instruments work, including the clock. There is a tea table on the back of the front seat and the dash is made of mahogany. There are two other tidbits worth mentioning: The antique will be sold with it original, albeit dilapidated, instruction manual and it will be offered with no reserve. I was unsure this car should even make the list, as it’s so darn weird, but I decided that it’s so out there that it deserved to be highlighted. 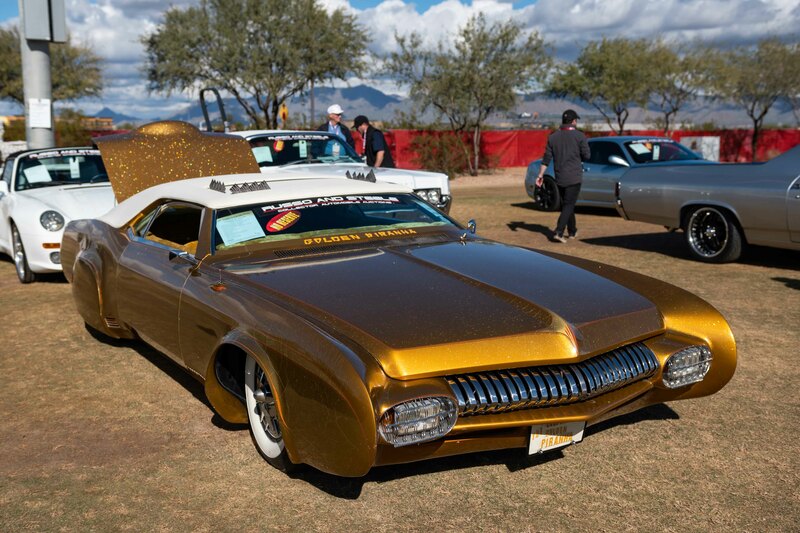 Built by customizer Frank DeRosa in 1982, this car began life as a 1966 Buick Riviera. 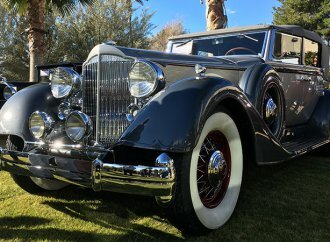 Nicknamed the Golden Piranha, this car has claimed numerous show awards and magazine features and is part of the late Blackie Gejeian’s collection. The exterior has, obviously, undergone extensive modifications that include a chop top-look and a grille from a 1951 Mercury. The pinstriping and lettering were added in 1982, as was the custom-made interior. Under the hood sits a Buick Nailhead engine. The car has barely modified in the past 37 years — the trunk interior is new — which I think is just neat. Obviously DeRosa did as well, as his signature is still on the dash. Opportunity for an auction story – people are line up outside for a couple hours to pick up their cars – some no sales, some purchases. Russo and Steel has customers waiting in line out side for multiple hours to abide by their check out procedures… many customers are very disgruntle. Very firm on their policies yet their system not working – some customers are leaving – some are saying their not coming back – many are skipping lunch as not to loose place in non moviving line. At 2pm they say things will start moving here shortly … you should do a comparison on how long it takes for other auction company’s to release cars..